All properties of a station may be changed after the registration. To do this, authorization with the API-key is required, which was sent to you in the registration e-mail! Select your station on the map by clicking on the marker on the map. Select the tab "Info" in the sidebar and click "Manage". Enter your API-key in the dialog. Make your desired changes in the appearing form. You may edit metadata, geolocation, photo, as well as the stations sensor configuration. Hint: If you have added a new sensor and want to download the updated arduino-sketch, a page-reload after saving is required. Click "save" or "cancel" in the top of the dialog to apply or discard your changes. 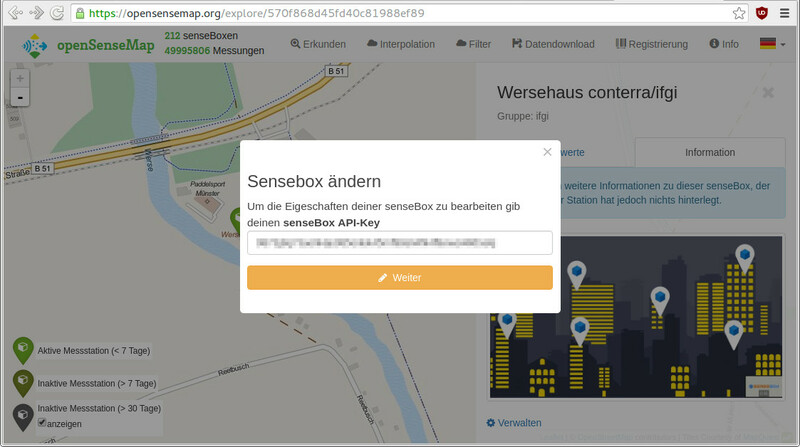 Follow the steps under "Modifying a station", then type DELETE in the textfield "Delete senseBox" and confirm. warning: All associated sensor data will be permanently deleted!